The Jararaca feeds on small rodents and bird such as the Brazilian Arboreal mouse, the Tufted Capuchin monkey, the House sparrow and the Guianan squirrel; which all share the same community. The Jararaca does not have many predators, one known predator is the Sharp Shinned hawk. 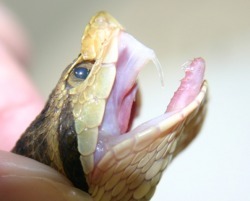 The Jararaca's trophic level is a tertiary consumer. It is a heterotroph meaning that it gets its energy from other organic sources. However, it is carnivorous, meaning that it only eats meat.